Bennetts Associates has renovated a 1930s cinema and added a brick, frosted-glass and copper extension to create this cultural centre in Chester, England. 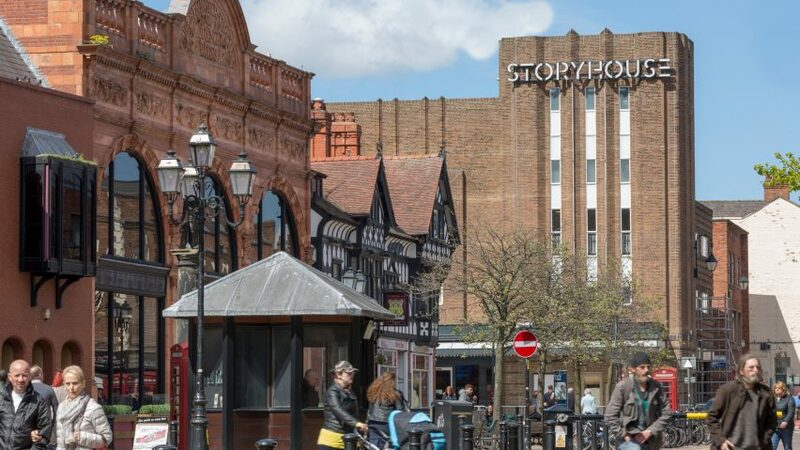 The British studio carried out the £37 million transformation for the listed Odeon cinema in Chester – a walled city in the northwest of England. A library, cinema, restaurant and cafe are set in the existing building, while the main auditorium and smaller studio are housed in the extension. The new cultural centre is called Storyhouse. The architects wanted the extension to be a "contemporary twin" to the existing cinema, which was completed in 1936 and features patterned brick walls punctured by three long, thin windows. The new 800-seat auditorium and 20-metre-high fly tower are clad in a similar blend of brick. A white cast-glass volume with a steel structure extends across the middle of this brick volume and hosts the walkways around the auditorium. A copper-clad block located above the auditorium provides a home for a smaller, flexible studio space and accompanying bar. It slightly projects off the edge on the southern side of the building and features large expanses of glazing that offer views across the city. "The new extension containing the theatre and studio has a similar footprint to the existing Odeon, but the main theatre's fly tower, and the elevated volume of the studio theatre result in greater overall height," explained the architects. A transparent glass section with translucent louvres slots in between the old and new structure. It is occupied by the central staircase, which is visible from the outside. Inside the existing building, the architects stripped out walls that divided the space into five screens. This opened up the space to the old proscenium – the arched wall around the stage – and the curvilinear Art-Deco style plasterwork that lines the ceilings. These both form a key feature of the library, restaurant and cafe area, which occupy two levels inside this shell. A mezzanine level replaces the cinema's old balcony and hosts a 100-seat cinema screen in a glass box, as well as a library. "The curved shape of the mezzanine edge follows that of the former cinema balcony, revealing the full scale of the proscenium plasterwork, which once surrounded the former Odeon's screen," said the architects. Red-painted stairs and walkways around the foyer space lead to this new level, while a large projection screen can fold down from the ceiling to host film screenings at night time. The 800 seats in the main auditorium are arranged in curving rows, but during the summer months and Christmas season a thrust stage will be built above the stalls. This stage will extend into the centre of the theatre, lowering the capacity to 500 seats, which will arranged around its three sides to create a more intimate setting. Bennetts Associates was founded in London in 1987, with further studios opening in Edinburgh in 1994 and then Manchester in 2015. It has worked of a number of theatre projects, including the transformation of the Shaftesbury Theatre in London's West End with a serrated weathering steel extension. The firm also renovated London's Old Vic and Glasgow's Citizens Theatre, and was shortlisted for the Stirling Prize in 2011 for its overhaul of the Grade II-listed Royal Shakespeare Theatre in Stratford-upon-Avon.